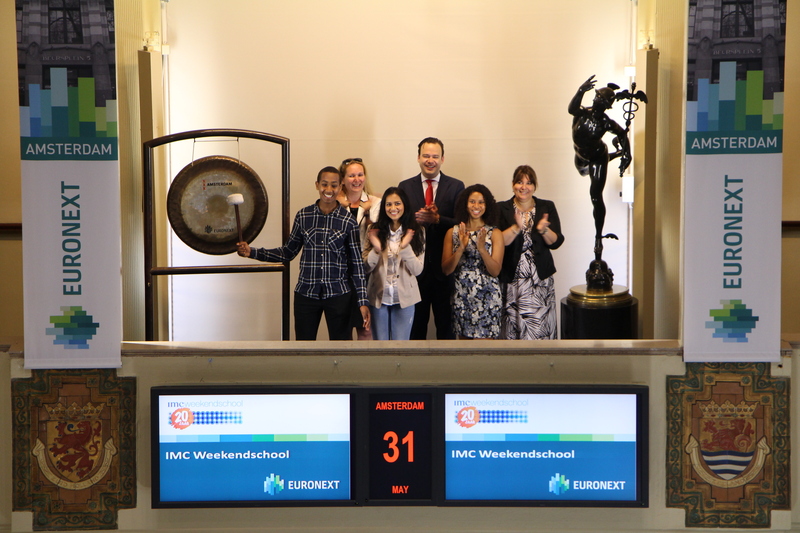 Ambassadors of IMC Weekend School open the trading day at the Amsterdam exchange. On 10 June the third group of ten ambassadors will be officially sworn in on ‘Heroes Day’. The ambassadors are selected alumni who follow a one year education after the regular education programme of three years. During the extra year the students learn how they can best articulate the impact IMC Weekend School has on them and others. IMC Weekend School was founded in 1998 by psychologist Heleen Terwijn. During research on how young students are motivated, she discovered that most youngsters lose their motivation when they have an unclear view of their professional future. This is especially the case within poor neighbourhoods. Terwijn came with an effective solution for this problem. Passionate professionals voluntarily teach the youngsters on Sundays about their profession. The purpose of IMC Weekend School is to educate and inspire youngsters so they have a solid base to make the right choices regarding their future education and professional career. In 2018 IMC Weekend School celebrates her 20th birthday. Voluntis specializes in the development of medical software solutions enabling patients to treat their own illnesses while in remote contact with their healthcare team. The company markets Insulia and Diabeo for diabetes, and eCO and Zemy for oncology. These digital companion products make it possible to guide and help patients to administer treatment, support them throughout the process and facilitate monitoring by their doctors. Jeroen Sonsma, director Binck Netherlands, sounds the gong for the start of the Personal Finance Day. This joint initiative between FD Mediagroep and BinckBank (ticker symbol: BINCK) takes place 30 May in Amsterdam. Dutch citizens are becoming increasingly responsible about organizing their own financial future. At the same time there is a growing amount of options available to take control over one’s own finances. That’s the central theme during the Personal Finance Day in Amsterdam, where, amongst others, the minister of Finance Wopke Hoekstra will be discussing the latest developments in personal finance. The topics will include: pensions, mortgages, healthcare, investing, savings and capital. 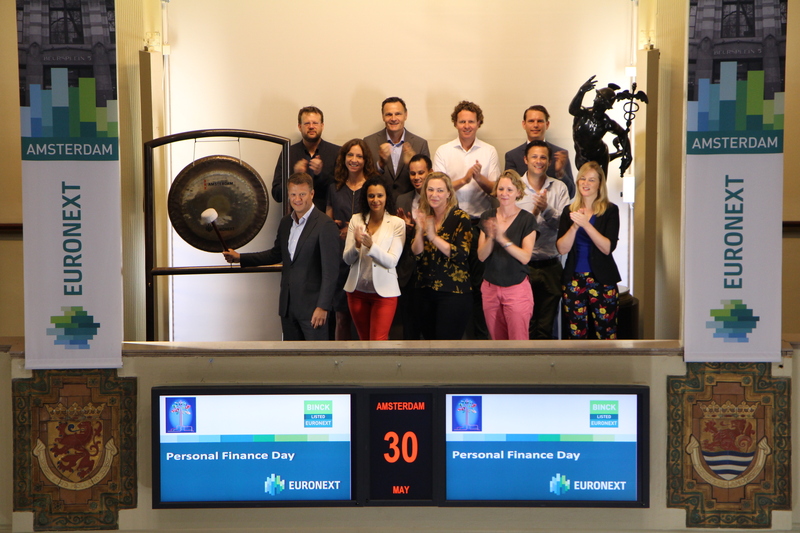 The annual Personal Finance Day is a joint initiative between FD Mediagroep and BinckBank and is also made possible by Pictet, Schroders and Think ETF. 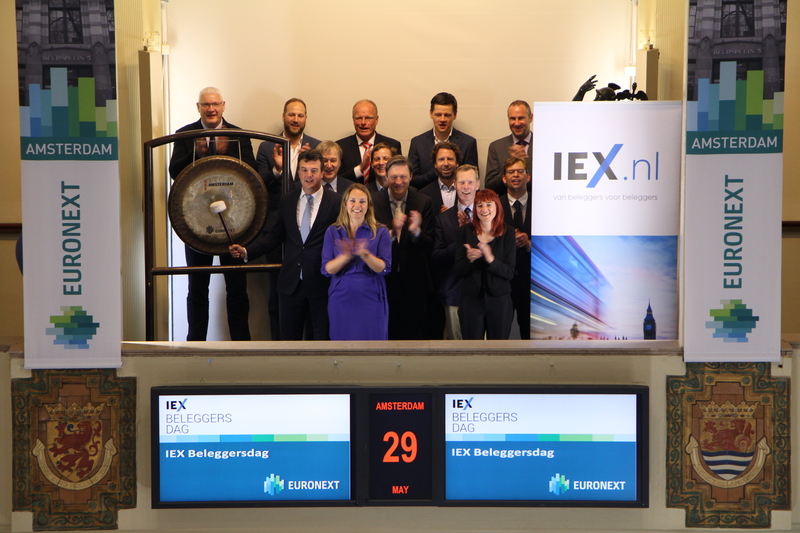 On 1 June the IEX Beleggersdag takes place in Amsterdam. In honour of this new event Jean-Paul van Oudheusden, COO at IEX, opens the trading day on the Amsterdam Exchange. In the past there was the Dag van de Belegger and before that the Dag van het Aandeel. Both popular events that attracted investors throughout the country who were looking for inspiration, contact with other investors, the stories of the CEO’s of listed companies and to further extend their view on investing. IEX believes that such a day for investors belongs on the agenda and therefore presents the first edition of the IEX Beleggersdag on Friday, the 1st of June, in the RAI Amsterdam. The line-up is impressively filled with CEO’s, trading experts, analysts and investment specialists who will inform the visitors about the latest developments in leading investment topics. The day will be led by Janneke Willemse and, among others, Werner Vogels (Amazon), Jos Baeten (a.s.r. ), Onno van der Stolpe (Galapagos), Sijmen de Vries (Pharming), Vincent van den Boogert (ING Netherlands) will be present. Furthermore, the top of investment experts will be present as well: Nico Inberg, Nico Bakker, Royce Tostrams, Hans Oudshoorn, Martine Hafkamp, Peter Siks, Bob Homan, Jos Versteeg, Bas Heijink and many more will share who they believe the winners of tomorrow will be. TheNextWomen is the international business accelerator for female entrepreneurs and investors. On Monday, May 28, TheNextWomen organizes an intimate dinner to celebrate the seventh edition of the launch of TheNextWomen100. TheNextWomen100 makes entrepreneurial role models visible. In order to qualify for a place on this prestigious list, the entrepreneurs must, among other things, have a turnover of more than € 2 million per year. TheNextWomen has been connecting female entrepreneurs, professionals, startups and investors for 9 years through its network. That is why this year emphasizes the importance of networks. During the meeting, entrepreneurs and investors are matched to each other on the basis of industry & revenue. Catherine Nini from Bourse Direct and Sébastien David from Société Générale open the stocks market in Paris. Societe Generale and Bourse Direct are launching an educational week "Au Coeur du Bourse" from May 28 to June 1, 2018 to train all private investors experts as beginners on the stock market. Are you a novice or expert investor? Do you want to take advantage of a pedagogy week "Au coeur de la Bourse"? Join the free training offered by Société Générale and Bourse Direct. - Simulation of live trading and an exceptional conference with experts. Register now on the website sgbourse.fr/"Au coeur de la Bourse"
Mladen Sancanin of PGGM opens the trading day with a sounding of the gong in Amsterdam today. In doing so PGGM, together with Blanco Services, celeberates winning the annual NRC Live Fintech Impact Awards. This year six finalists competed for the award. New financial services and technological innovations create a new reality for the financial sector. 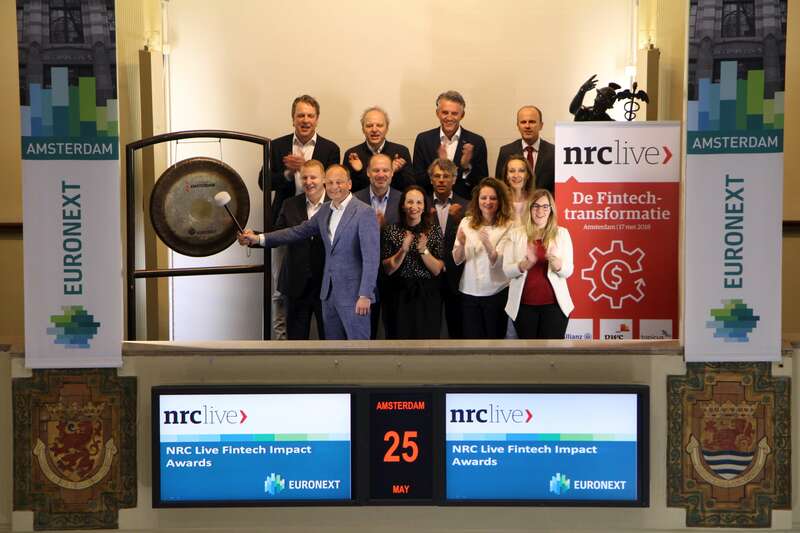 The NRC Live Fintech Impact Award is an NRC initiative to stimulate innovation in the financial sector and to challenge innovators. The impact on the sector and the customer is central to this. The winner for 2018 was announced on 17 May. Marc Schillaci, CEO of Oxatis, rings the bell to celebrate the companies recent IPO. Oxatis is the leading company specializing in the creation of e-commerce websites in Europe. The group offers SaaS solutions as well as consulting, SEO and training services. 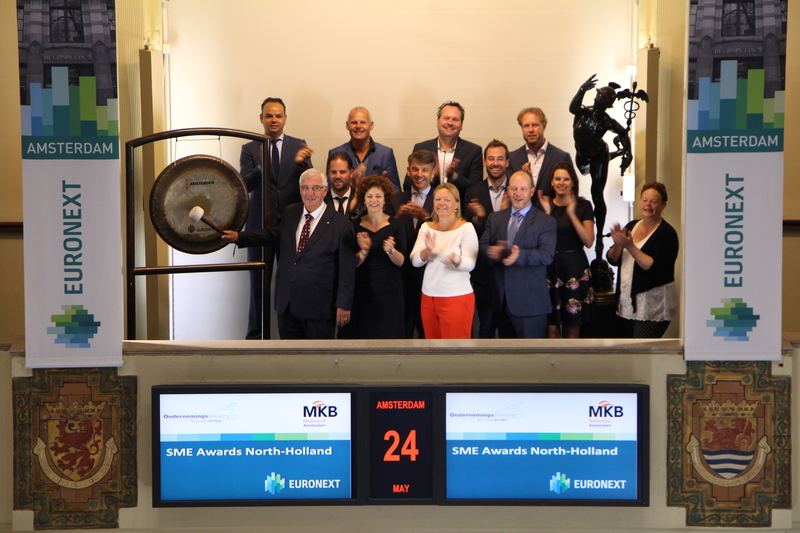 The winners of the North-Holland Entrepreneurship awards (OVNH), together with MKB Noord-Holland and the committee members of the OVNH, open the Euronext exchange in Amsterdam. The Philharmonie theatre in Haarlem was filled with participants and interested parties for the 12th edition of the North-Holland Entrepreneurship awards. During this festive evening, Koninklijke Vezet (Large SME), KeyKeg | Lightweight Containers (Medium SME) and Drukkerij Proja (Small SME) have been chosen as winners. In addition, Fort Resort Beemster was rewarded with the well-deserved Public Choice Award. In recent months, hundreds of companies have been competing for the now coveted title. The thirty finalists showed their best side on the election night. After this it was up to the jury to choose a winner in each category. For this edition the organization received a record number of applications. "This shows how much the election lives in North Holland," says Renilt Suijkerbuijk, chairman of the OVNH Steering Committee. Oskar Guilbert, CEO, Don’t Nod Entertainment, closes the European trading day in Paris. Don’t Nod Entertainment is specialized in the development of video games for consoles and PC based on original concepts and innovative technologies. Since the release of Remember Me and the critically acclaimed blockbuster Life Is Strange, the studio is internationally recognized for the quality of its narrative games set in immersive and innovative worlds. 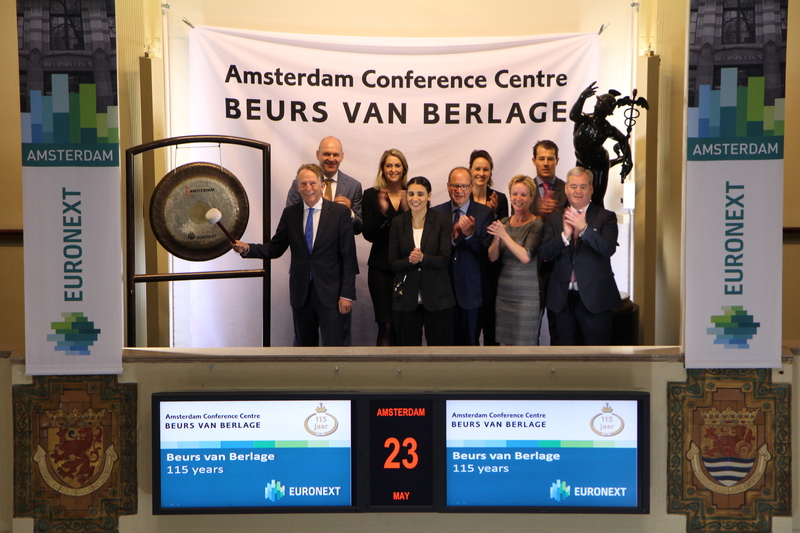 In celebration of its 115-year anniversary, Wienke Bodewes, Managing Director AMVEST, Chairman of the shareholders meeting of the Amsterdam Conference Centre Beurs van Berlage, opens the trading day in Amsterdam with the sounding of the gong. 27 May 2018 marks the 115th year of the Beurs van Berlage, a milestone that will be celebrated all year. The festivities will culminate on 15 September, on that day the Beurs van Berlage shall put all its facilities at the disposal of a social benefit organisation, Resto VanHarte, for one full day. The Beurs van Berlage has a rich history. Upon its opening, four types of exchanges took residence in the building, each with its own space, meeting rooms and auction halls for conducting trade. Following the departure of the exchanges, the building took on the function that its architect, Berlage, had in mind even while he was designing the edifice: a palace for the public. Today, the Beurs van Berlage serves as a meeting place for congresses and events, with two restaurants, a meeting centre, three escape rooms, 45 different companies and even a chocolate shop. For the second year in a row, CACEIS won the Innovation Award at the Global Custodians 2018 Leaders in Custody Awards. 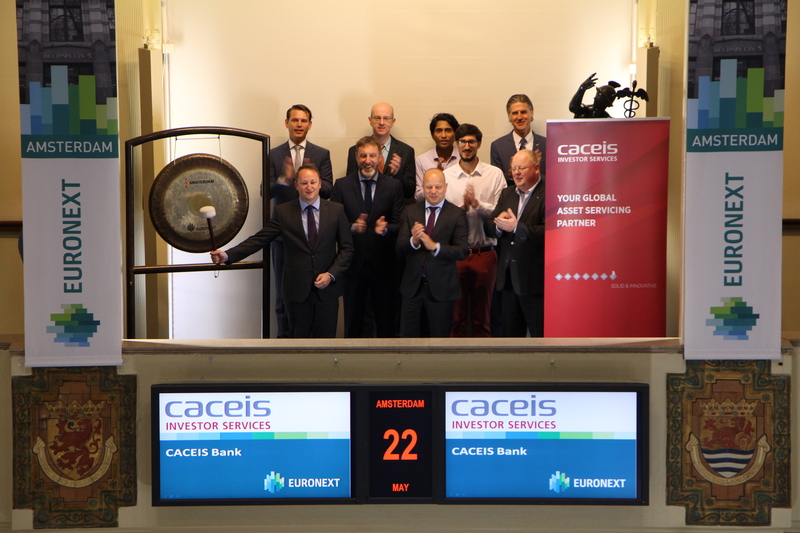 Managing Director of CACEIS Bank Netherlands, Ronald Borst, sounds the gong to celebrate this. CACEIS received this prize during the 2018 Leaders in Custody Awards ceremony held in London. CACEIS received the Innovation Award for TEEPI (Tailored Electronic Exchange Platform for Investors). Through TEEPI, market parties can exchange data in an efficient and secure manner in order to comply with the legal obligations in regards to Solvency II, PRIIPS and MiFID II. 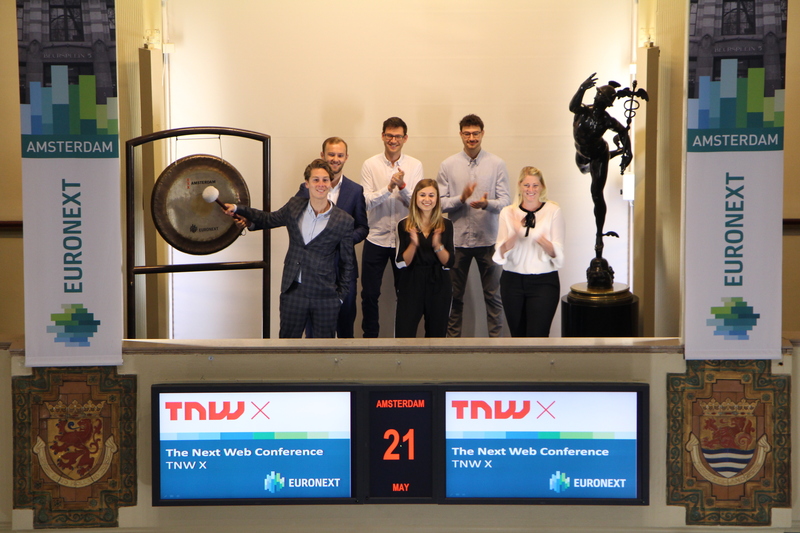 This week, the 13th edition of The Next Web (TNW) Conference will take place in Amsterdam. Sebastiaan Roebroek and Arno Nijhof, members of the newest innovation team of TNW, TNW X, sound the gong. TNW Conference is all about deep learning on the future of technology. On May 24 and 25, 2018, over 15.000 digital minds will come together to join the global tech conversation. This edition will also mark the launch of TNW’s new innovation team: TNW X.
TNW Conference has been running since 2006, bringing together technology experts driving business innovation. TNW X will continue to bring people together, focusing on connecting corporate and governmental institutions to the world’s most innovative startups. 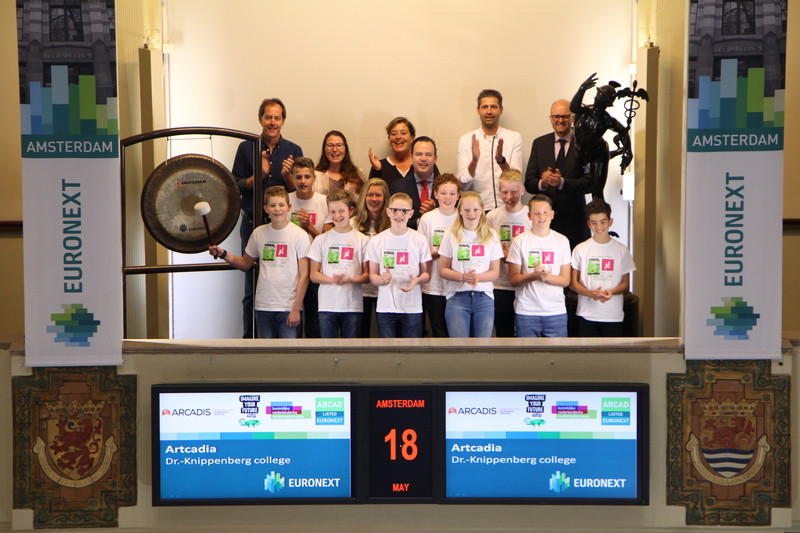 Dr.-Knippenberg college from Helmond celebrates winning the Artcadia Art and Technology Finals with a sounding of the gong. The contest is organized yearly by design consultancy firm Arcadis (ticker symbol: ARCAD), the KNHM foundation and Canon Business Services. The contest was organized with the objective of having secondary education pupils experience the fascinating world of technology. The contest was held for the eighth time with a record number of 130 schools entering the contest this year. Twelve different schools presented their take on the future in Eindhoven. With their idea for a smart park, Dr.-Knippenberg won the first prize: a trip for ten pupils and two teachers to visit exceptional places and lovely, technically interesting projects in Warsaw where they will be taking a look behind the scenes. Tech start-up Liliane partnered up with Euronext to launch an investment management championship with French finance schools and universities. Particularly relevant to new generation retail investors, Liliane provides modern portfolio and asset management services for funds via an online portal. The championship consisted in involving 255 graduate students pursuing a Master’s of Finance in 15 French schools and universities in a portfolio and asset management competition. Their challenge? Put themselves in the role of a professional asset manager and create the best investment strategy. 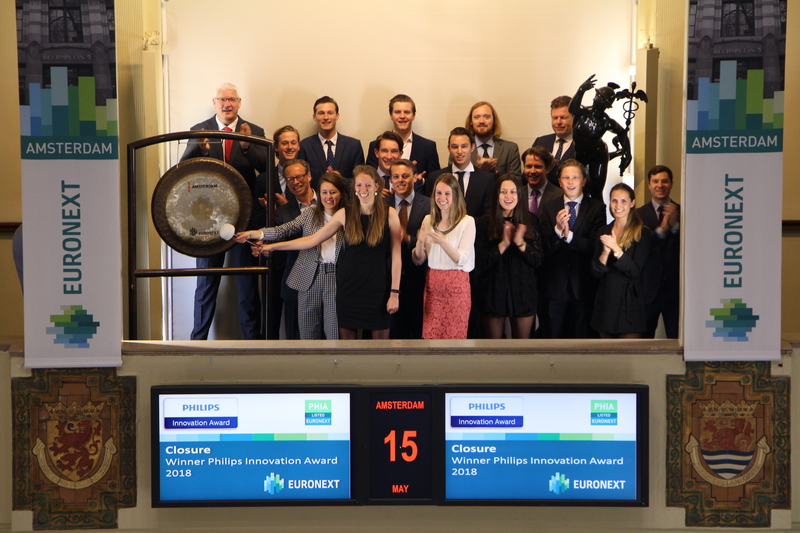 Euronext decided to accompany Liliane as this championship was aligned with a key objective of Euronext Fund Service: simplify and open up fund investment to make it accessible to all investor profiles. 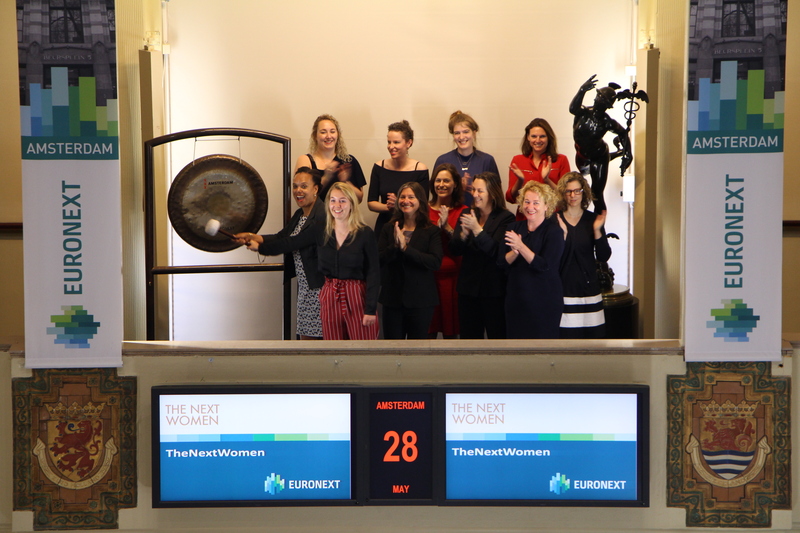 Alongside Liliane, and partners Lyxor Asset Management (ETF issuer) and Morningstar, Euronext hosted a closing bell in our Paris offices on 17 May for the championship’s awards ceremony. Better Options LLP sounds the gong on the Amsterdam exchange to highlight the partnership with IG Markets. Head of IG Markets Germany and the Netherlands, Michael Lippa opens trading at Euronext Amsterdam. In 2015, Better Options Amsterdam started a partnership with IG Markets, a British broker founded in 1974 with a focus online trading. This unique partnership offers IG direct access to the trading floor of the Amsterdam Exchange. The sounding of the gong highlights the 3-years anniversary of this partnership. 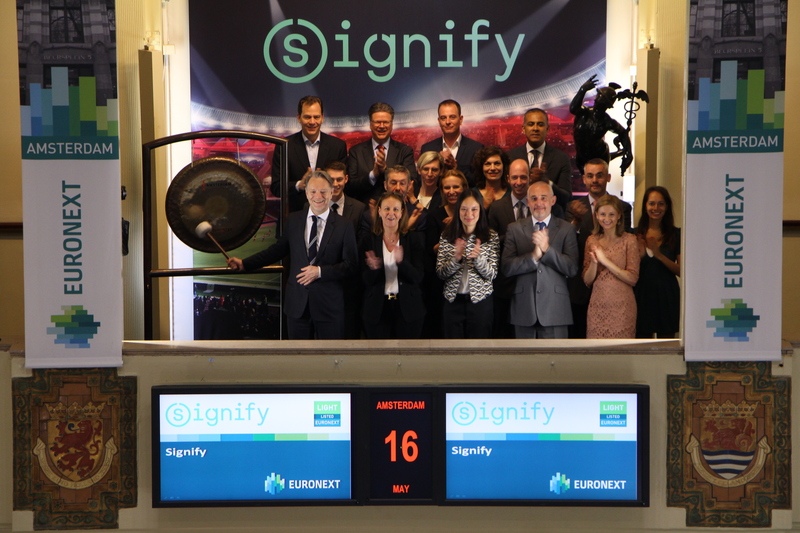 To mark the company’s first trading day under the name Signify, Chief Financial Officer Stephane Rougeot, sounds the gong. Signify became the new company name of Philips Lighting as of May 16, 2018. Signify (ticker symbol: LIGHT) is a world leader in lighting for professionals and consumers and lighting for the Internet of Things. Their Philips products, Interact connected lighting systems and data-enabled services, deliver business value and transform life in homes, buildings and public spaces. With 2017 sales of EUR 7.0 billion, approximately 32,000 employees and a presence in over 70 countries, Signify unlock the extraordinary potential of light for brighter lives and a better world. Chantal van der Velde and Graciëlla van Hamersveld sound the gong. The co-founders of Closure celebrate winning the annual Philips Innovation Award. The Philips Innovation Award is the biggest student-entrepreneur award in the Netherlands. This year, the 13th edition of the award was organized by students, for students. The Philips Innovation Award is a platform where each participant can benefit. Participants get personal feedback, practice important skills, receive coaching and build a network. During the Semi-Final, the 30 best participants had the chance to pitch their ideas in front of investors and entrepreneurs, while they were judged by a professional jury. The 8 best start-ups made it to the final, where 800 visitors experienced an inspiring evening with key-note speakers and innovations of high-quality. Closure won the Innovator League and received a prize worth €50.000. Circal Technologies won the Rough Diamond League and received the prize worth €10.000. Marco van Zijverden, CEO Dutch Flower Group, sounds the gong to celebrate, together with colleagues, winning the Family Business Award 2018. The family business was chosen from a select group of five nominated companies. These companies were selected from hundreds of family businesses in collaboration with partners KPMG and ABN AMRO. On 11 April Dutch Flower Group received the Family Business Award 2018 from Jan Kees de Jager, former state secretary and minister of finance and since 2014 CFO of KPN. 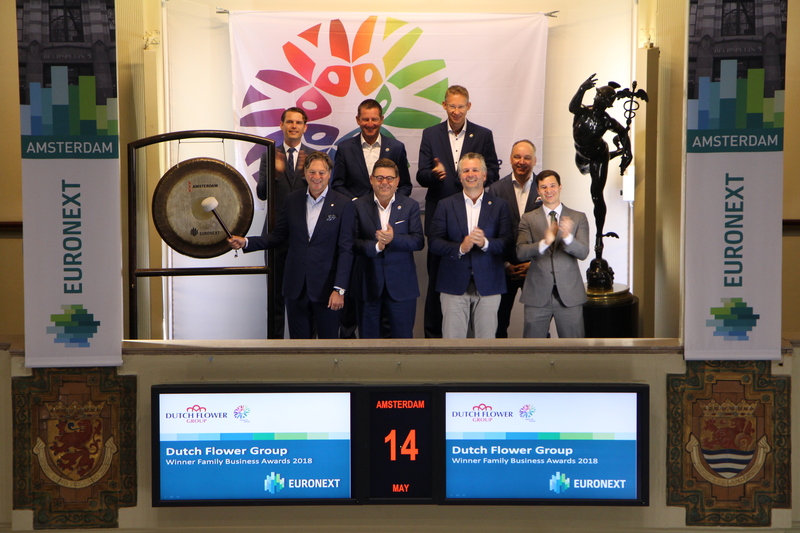 Dutch Flower Group, from the Van Zijverden and Van Duijn families, comprises 30 specialized trading companies that jointly serve the entire floriculture chain. It is a real family business that is experiencing enormous growth internationally and is now the largest in its market with an annual turnover of € 1.5 billion. Under the motto "Making Life Colorful", knowledge, quality, service, innovation and sustainability are leading principles in the business. The Roparun starts Saturday 19 may 2018 in Hamburg and Paris and finishes White Monday 21 May in Rotterdam. 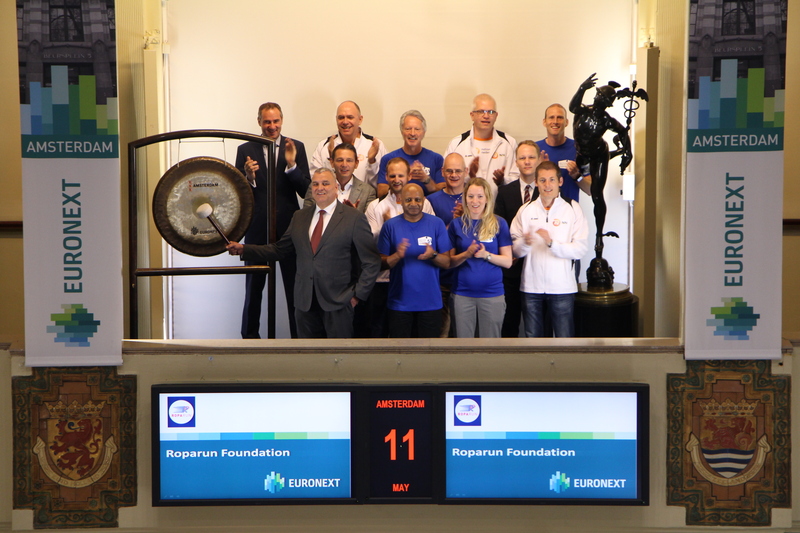 Director of Roparun Foundation Wiljan Vloet sounds the gong, accompanied by participants of teams Unilever (ticker symbol: UNA) and NN (ticker symbol: NN). The Roparun is a relay race of more than 500 kilometers from Paris and Hamburg to Rotterdam, in which people work as a team to give a collective sports performance in order to raise money for people who suffer from cancer. This year’s 27th edition has 312 teams participating in this challenge. Besides the physical challenge, the team must also make an effort to raise money for the cause. Teams do this by organizing various activities. The three teams who raise the most money and the six teams who win for their running speed are honored during the final celebration of the Roparun, which takes place a few weeks after the finish. Over the past editions, more than seventy-eight million Euro has been raised. The Dutch organizers of the worldwide MillionMissing campaign open the Amsterdam stock exchange by sounding the gong. By opening the trading day, they raise a symbolic alarm about the funding of research of the disease Myalgic Encephalomyelitis (ME). The MEAction Network is an international organization for equal health rights for people with ME, a neuro-immunological disorder with severe disabling consequences that causes heavy exhaustion, pain, cardio logical problems and exercise intolerance that occurs 24 to 76 hours after small effort and can lead to a crash. MEAction continuously campaigns for more biomedical research, education of doctors and equal civil rights for people with ME under the title MillionsMissing. On 12 May, the MillionsMissing, who miss their lives, show themselves all over the world. This year in the Netherlands, this campaign will be mostly virtual. 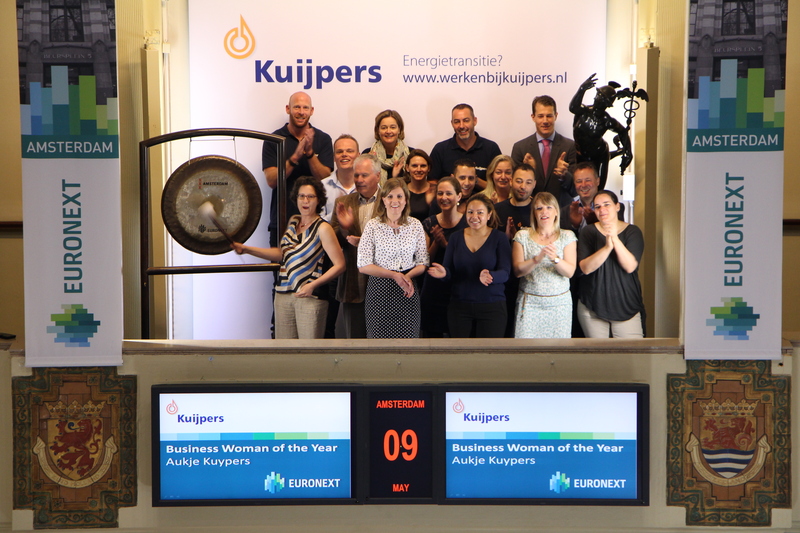 Businesswoman of the Year 2018, Aukje Kuypers, opens the stock exchange in Amsterdam. Kuypers is chief executive of technical service provider Kuijpers. The Businesswoman of the Year is an international prize that is supported by champagne brand Veuve Clicquot, part of the LVMH Group, listed on Euronext (ticker symbol: MC). As a fourth generation member of the family, Aukje Kuypers heads up the family business (established in 1921) with offices throughout the Netherlands. With a turnover of almost €200 million and 1150 employees, the company is engaged in the sustainable design, construction, maintenance and operation of technical installations. The company's mission is to realize energy-neutral, smart and healthy installations only. Kuijpers is active in various sectors, such as culture, food, pharma, high tech, health care and education. 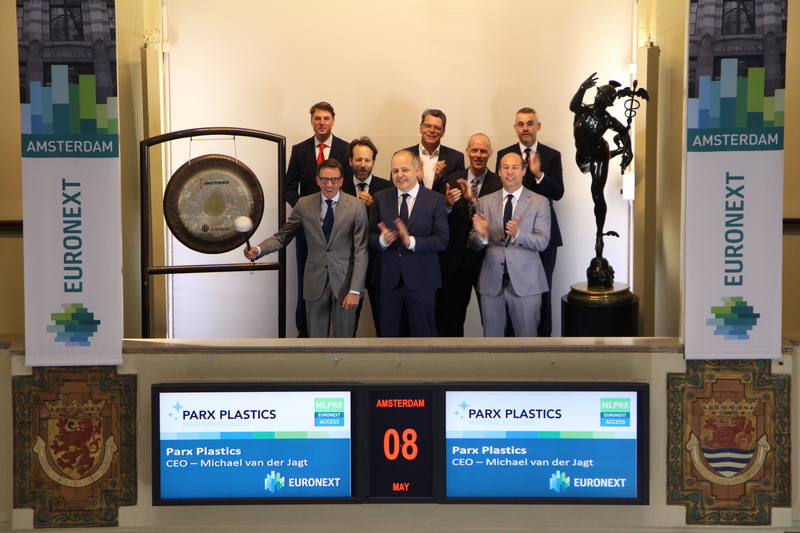 Dutch company Parx Plastics N.V. realized its listing on Euronext Access in Paris recently. To celebrate this listing, Michael van der Jagt, CEO of Parx Plastics, opens the trading day by striking the gong. Parx Plastics (ticker symbol: MLPRX) has developed an innovative technology to make plastics antibacterial by using an essential nutrient. The integration of a body’s own trace element into plastic results in a defence mechanism against bacteria, which leads to a reduction of at least 99% of the number of bacteria on the surface of the treated plastic. The technique is particularly interesting for food packaging and for medical applications such as implants.